NetEase (网易) founded in 1997, is a Chinese Internet technology company providing online services centered on content, community, communications and commerce. NetEase develops and operates online PC and mobile games, advertising services, email services and e-commerce platforms in China. NetEase is one of the largest Internet and video game companies in the world. NetEase Prepaid Card (CN) can be used to recharge NetEase Pass and purchase various games and value added services from NetEase. Buy NetEase Prepaid Card (CN) to enhance your gaming experience now! How to Redeem a NetEase Prepaid Card (CN)? 1. Please login to Netease Reload website. 2. 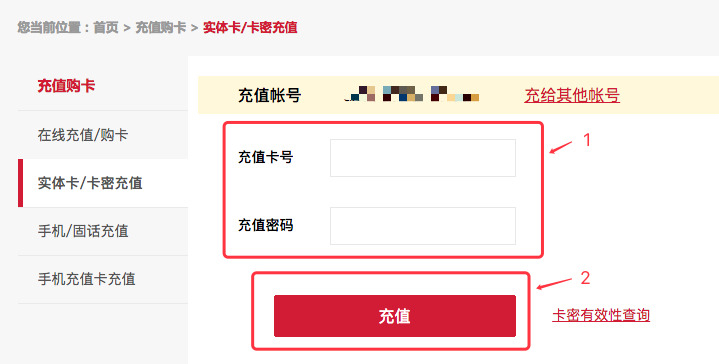 Fill in details – NetEase Prepaid Card Serial & Password, click ”充值”.